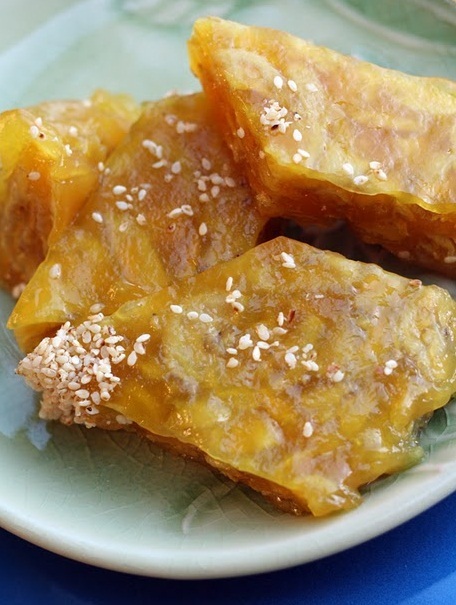 Another Vietnamese dessert that might catch your eye on the Vietnamese grocery shop counter is Banh Chuoi. Banana cake, while the correct translation, isn't terribly helpful as there are at least another two types of banana cake that is very different from this. But this one is much more spectacular to look at. 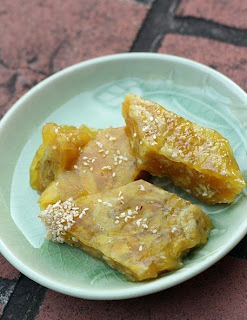 Yellow/orrange, shinny and almost glistening this banh chuoi really does demand to be noticed. They shine so much I found it hard to take these pictures without cake reflection! Basically this cake is made up of layers of sliced banana (look carefully) cooked in glutinous rice flour which gives it the intense jelly shine and consistency. It's sold, cut up in diamonds with sweet coconut milk and a small packet of sesame. When you get home, you're meant to pour the coconut milk over your cake and then sprinkle with sesame. 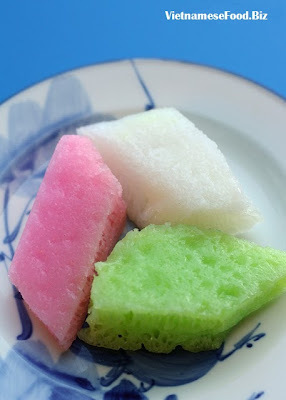 Vietnamese cakes: coloured rice cakes.. read more here.